Toyota Hilux confirmed return to Japan! 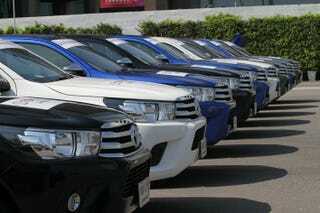 I have read a news on Yahoo Japan regarding the revival of Toyota Hilux in Japan. Pickup Trucks, Japan&apos;s Forbidden Fruits. Yes. The iconic luxury pickup truck is still on sale everywhere outside North America, but has been killed off from Japanese market 13 years ago. Japan still has an old stupid mindset of rejecting pickup trucks as lifestyle vehicles, preferring old-fashioned station wagons for that place. The Japanese market had strong aversion to the standard, bonnet-type pickup trucks since 1970s, but this went too extreme in 2000s, along with incompatible rules, that put an ultimately tragic end to the pickup truck market in Japan. However, times change, the station wagon market has been under decline In Japan as SUVs and MPVs took over place. Still, the aversion to pickups are still on in Japan, until recently, when the want for pickups to come back have suddenly increased. From the ending of limited-sales Mitsubishi Triton and Toyota Land Cruiser 70-Series pickups, the demand for these types of pickup trucks have shown its signs of revival. The hope and hype for the pickup trucks aren’t stopping in Japan, like they did last decade. Toyota Hilux to be revived in Japan?! Recently, Toyota Hilux were ones showcased in Tokyo Auto Salon, signalling the return of the luxury pickups a possibility. However, this made real when leaks of brochures were flowing into Twitter, making this possibility even possible. The revival of luxury pickup trucks finally came to light when Japanese news reported recently. According to the news of Yahoo Japan’s Carview site, the new Hilux is the one currently sold around the globe, and will go on sale in Japan this September. Some news portals also said that the new generation of luxury pickups will be made at Hino’s Hamura plant in Tokyo. The same plant that made FJ Cruiser and the last, 6th-generation Hilux (Japanese don’t get 7th generation Hilux due to extinction of pickups in JDM). With return of Hilux in JDM confirmed, will the luxury pickup truck end Japanese’ aversion to pickup trucks and reviving the pickup truck market in Japan? Will it reignite Japanese car enthusiasts’ interests in pickup trucks? Chances of other pickup trucks being sold in Japan?